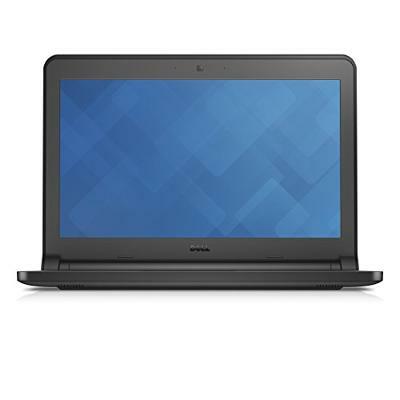 Dell Latitude 3340 is a good notebook available at an affordable price that performs flawlessly from the moment you get your hands on it. It comes with Intel i3 4005U processor and 1.70Gz clock speed. It also boasts of a 13.3" HD Wide Screen, 4GB RAM, 500GB Hard Drive Capacity and an HD Web Camera. Connectivity is easier thanks to Bluetooth, Wi-Fi and Wireless Ethernet and HDMI. This piece has Windows 7 Pro 64 bits already installed. multi-touch touchpad, a card reader, 2 x USB 3.0, headphone/microphone combo jack, LAN, HDMI and a Mini DisplayPort. For people who use a notebook all day, it is a good choice as it has 6-cell lithium ion battery with a capacity of Capacity 65 Wh. This notebook has something engraved on the top casing and a few marks of a permanent marker that must not bother a user as they don’t hamper the functionality or performance in any manner. I am a student who needed a functional notebook for completing school projects. This piece went beyond my expectations in terms of performance and looks. Highly recommended. I was looking for a gaming-friendly device, and this is a perfect piece for it. It’s 13.3’ HD screen lets me enjoy every game to the fullest extent. When I was hunting a good notebook online, my online worry was RAM. This device is a perfect one as it offers 4 GB RAM at such a low price. I am a professional photographer who lives and breathes images. I like the HD camera of this notebook best. It adds lives to everything I capture. A long-lasting battery is always an expectation when I seek a digital device. This problem was solved by this piece as the battery easily lasts 6 hours with light use. Windows 7 is the best OS I have ever operated. It’s simple, uncomplicated and doesn’t need many updates. Thanks to this notebook, I got my favorite OS again. I had a lot of images and videos on my old PC. Thanks to the 500 GB storages pace of this device, I was able to shift them all without losing any data. A good buy. My last laptop had a slow Bluetooth and no Wi-Fi connectivity option. This baby has both, and I love sharing files via it as the process is quick as lightning. I am a music lover, and the sound of this notebook is simply amazing. This is a must buy for all party lovers like me. I bought a couple of pieces of this notebook for my startup team, and we achieved every goal we wanted. A true value for money product!